Unlike my inner circle apparently believed, I actually survived my solo coastal road trip through Finland, all the way from Southern Rauma to Muonio in Finnish Lapland—and back! If the beauty of the Finnish Coast is still a mystery to you, keep on reading! In this post I’m telling (and showing) you the highlights of my coastal road trip through Finland. I bet you’ll want to do the same and soon! The main purpose of this whole road trip was to spend four adventurous and active days in Muonio, in Finnish Lapland, invited by Harriniva Hotels & Safaris. For me personally this trip was such a nostalgic experience as I have been in Harriniva on a school trip for more than 19 years ago. As you probably believe, I was super excited about the approaching trip and very curious to see if I recognized the place after so many years. You don’t need to hold your horses any longer. I honestly admit I didn’t. Harriniva has changed a lot in 20 years, which didn’t surprise me at all. This time I wasn’t accompanied with 20 class mates, but two fellow Finnish travel bloggers Lotta (watia.fi) and Gia (matkakuume.net). As usual, I didn’t satisfy with only 4 days in Lapland. Instead of train I decided to do a coastal road trip through Finland, all the way from South to North and back, and aimed to see and experience as much as I possible could along the road. When I started my road trip I drove quite directly from Southern Rauma to Lapland, apart from one night camping on a beautiful spot in Rahja Archipelago in Kalajoki. I had asked for a few camping tips from an Instagram acquaintance Minna, who knows the area very well. You should definitely check out Minna’s Instagram gallery as it’s full of beautiful landscapes, mainly photographed in Kalajoki. If these pictures don’t make you fall in love with Finland, nothing does! The spot I chose was perfect for car camping; beautiful sea views completed by total privacy. During the whole evening only one other car stopped by. Apparently I was a scary sight with my Ford Focus, as the car turned around and disappeared immediately. Even if I drove quite directly all the way to Muonio, I kept my eyes open and got some great ideas where to visit on the way back home. To be honest with you, it was the best possible decision to split the driving for two days. I don’t drive much; at home I don’t need to, as in Rauma a bicycle is a lot faster way to move from one place to another, and on our road trips Daniel always volunteers to drive. I think I must have driven around 100 kilometers during the past year. Therefore I didn’t even consider driving 1,000 km straight from Rauma to Lapland. When I arrived to Harriniva the others were already waiting for me. Gia had arrived already the day before, and Lotta had travelled by train overnight. The first pleasant surprise was to have a room with a sauna. That was exactly what I needed after two days of driving and a night in a car. Perfect! Oh yeah, during the first evening in Harriniva we went for a little walk together with Lotta. A little walk to Sweden. Lotta snapping on the border of Finland and Sweden above the river Muonionjoki. The actual program of our blogging trip started on the next morning by visiting Harriniva Husky Farm. When we entered the farm 420 husky dogs were welcoming us by barking, sniffing and begging for attention. I know husky farms and safaris are a deal breaker for many people, and the ethics of such activities divides opinions a lot. We’ll get back to the husky activities later on this blog. For now I just wanted to show you how adorable these little huskies are. Especially the playful puppies just melt your heart, don’t they? The activity that I was definitely waiting for the most was next in line: White water rafting! As thirsty as I am for adrenaline, I don’t recall doing white water rafting, at least not on adult age. Well, I’m happy to announce that I have finally done it, and I REALLY enjoyed it! The rapids of the river Muonionjoki made the cross sea in Rauma feel like tiny little waves. Even if I was fully equipped with thick rain coat and trousers, our rafting pilot ‘Kalle the Captain’ literally made my underpants wet! 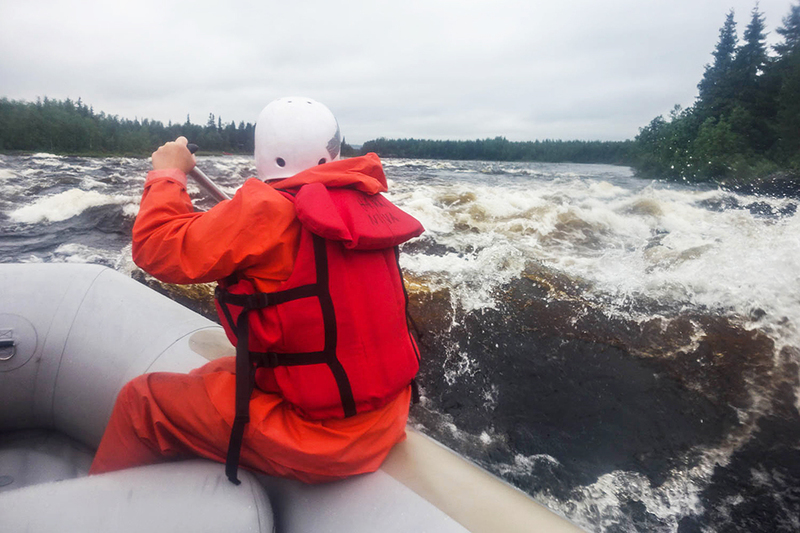 The battle against the rapids of Muonionjoki. Photo taken by Gia. After the lunch it was time to leave Harriniva behind. We drove to Torassieppi, another holiday destination managed by Harriniva just 20 km away. I was excited to see Torassieppi with my own eyes, as I had written about it on the Finnish travel magazine I’m working with just half a year earlier. At that time I wrote the article based on a phone interview, and now I finally had a chance to experience the place myself. Soon after arriving to Torassieppi we went to test how fatbikes are driving on the forest paths softened by heavy rains. The rain caught us during our biking trip, but it didn’t matter. I was so surprised how easy it was to drive through huge mud puddles and tricky forest routes. But it wasn’t always so easy. The true highlight of our fatbike trip was definitely Lotta falling over in a puddle. Luckily she didn’t hurt herself, but she was completely covered with mud and we couldn’t help laughing at her (it’s safe to laugh when the person falling over is laughing, right?). After the fatbike experience we were already wet, so there was no problem with heading back to the forest to pick up some wild mushrooms, berries and wild herbs together with Lasse, the chef of Torassieppi. After the forest walk we entered a hut where Lasse the Chef was preparing an amazing dinner on an open flame using ingredients we had gathered from the forest. Have you heard about super food? Well, this is it! What wouldn’t you do for fresh mushrooms and berries, right? Pyry, one of our Harriniva hosts, is showing an example. Photo taken by Gia. Super food prepared by Lasse the Chef: Arctic char, mushroom sauce and a side dish made of wild herbs found in the forest. All prepared on an open flame. Delicious! The next morning we went for a different kind of a hike. Torassieppi has its’ own husky farm, even if it’s a lot smaller than the one in Harriniva. Huskies can’t tolerate the summer weather too well, but they are happy to go for a little walk in the woods. On a summertime husky hike the dog is attached to hiker’s waist with a belt. I must say a husky hike was an extraordinary experience, even if I still prefer hiking on my own. I’m traditional like that. Hmm, now when I think of it, I do go to mushroom forest with my two cats fairly often… or let’s say they go to mushroom forest with me. They’re both running free, competing with each other, and then come running back when they’ve gone too far away from me. If I only could teach them how to find a good chanterelle or porcini spot… you know, a bit like the pigs hunting for truffles! Also huskies deserve a little break during a hike. After the lunch we went for a canoeing trip to nearby lakes, Sieppijärvi and Torasjärvi. As you might know, I love kayaking and do it a lot at home, but it’s been quite a few years since I’ve been canoeing last time instead of kayaking. Our canoeing trip started with a great weather. …but on the way back the weather got back to normal. That means pouring rain. But we didn’t care. Sometimes you just need to get wet to really feel you’re alive, right? 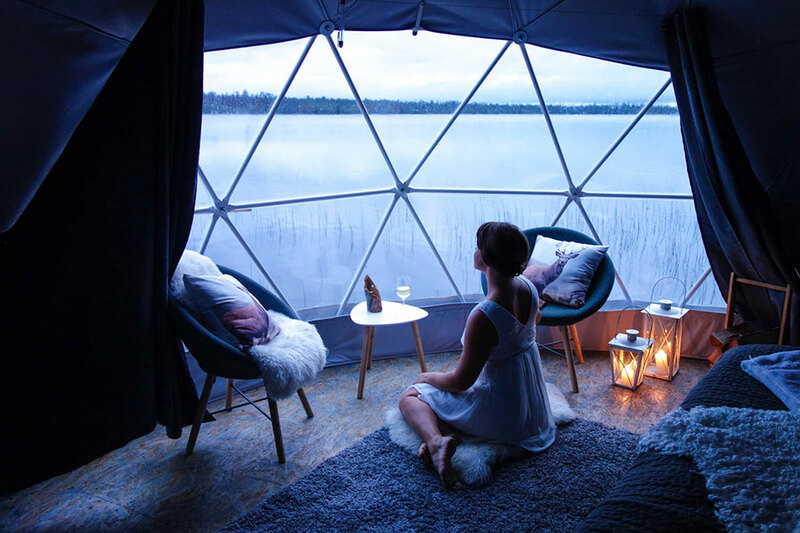 After sauna and (again super delicious) dinner prepared by Lasse the Chef it was time for me to experience a touch of luxury; I got to spend a night in Aurora Dome luxury tent. This is what they call glamping = glamorous camping, in case you’re unfamiliar with the fancy word. Lotta and Gia got to spend two nights in Torassieppi Aurora Domes. I was happy with one night and spent the first Torassieppi night in a normal cottage. After all, personally I consider a night in a cottage luxury as well. Not all Finns have their own summer cottage, you know! I will tell you a little bit more about my night in Aurora Dome luxury tent a bit later, but have a look at these photos; Would you fancy a night in these glamorous tents? A little peek inside Aurora Dome. The girl in the photo is Gia, photo is taken by Lotta. The blogging trip organised by Harriniva was coming to an end. We only had one more activity left: Visiting the reindeer farm in Torassieppi. The reindeer dude (as I like to call him) called Tommi was telling us some fascinating facts about reindeer and their lives in Finnish Lapland. I was impressed how well he was answering our tricky questions, and I was surprised how much I was able to learn about these funny Lappish animals. After visiting the reindeer farm it was time to pack my stuff and hit the road again. A few days earlier, when I was driving to Lapland, I didn’t see even one reindeer on the road. Which was great, as hitting one could be lethal at least for one of us. I wasn’t as lucky when driving back home! During the first day of driving I must have stopped at least 10 times due to silly reindeer on the road. They’re funny animals like that, they don’t jump on the road unexpectedly from the woods, but they just walk—very slowly—in the middle of the road. When that happens, you can’t really do much else than drive 10 km/h behind them until they decide to go back to the forest. Luckily I wasn’t in a hurry. Because in Lapland no one is in a hurry. The least the reindeer! Now I was really able to enjoy the freedom that my car gave me! Gia had already left by plane, and Lotta was taking a train back home. All 3 of us spent 4 wonderful days in Lapland, but the two of us didn’t have time to climb on any of the mountains. Thanks to driving, I was able to do whatever I wanted. And I took full advantage of it! I’ve heard so many stories about a mountain called Särkitunturi that I had to see it myself. Särkitunturi is also located in Muonio, so the first part of driving took only 20 minutes. Climbing on top of the mountain, having an ‘oh, wow’ break on the top and coming back down took a bit more than two hours altogether, and it was SO TOTALLY WORTH THE EFFORT! What can I say about Särkitunturi? I found a paradise on top of a fell in Finnish Lapland! I guess you don’t need any explanations after seeing these photos! I really want to note that I transferred them on the blog directly from my camera. No editing needed. You can’t go wrong with views like this! After conquering Särkitunturi I headed for a canyon lake called Pakasaivo, also known as ‘The Hell of Lapland’. I will get back to this adventure with its’ own, hellish story in the near future. My plan was to camp in Aavasaksa, a small riverside place in Ylitornio. I wanted to find a beautiful camping spot either by the river Tornionjoki or on top of a small mountain, Aavasaksanvaara. I had asked for some tips to Aavasaksa from a local entrepreneur Heidi, who owns a company called Aavasaksa Experience. Again I remembered her because I had written an article about them to the Finnish travel magazine I’m working with. It turned out Heidi had a nice little surprise for me; She had prepared me a small, private cottage in her holiday village by the river Tornionjoki. I wouldn’t say no to this! I will share with you Heidi’s best tips for a holiday in Aavasaksa in the following weeks—stay tuned! A stunning sunset at Aavasaksa Experience holiday village by the river Tornionjoki. On Friday I followed Heidi’s tips for Aavasaksa. The first task was to conquer the viewing tower on top of Aavasaksanvaara, a small but fairly famous mountain in Southern Lapland. I have a confession to make… Even if I told you my road trip was all about the beautiful Finland, my next destination, Luppiovaara ( = Luppioberget ) is located in… SWEDEN! So, after taking over Aavasaksanvaara, I drove over the river and crossed the border. My road trip had moved to Sweden for a couple of hours. For my defense I must say that the magnificent views opening on top of Luppioberget are all Finland!!! Or… of course it depends which way you’re looking at. 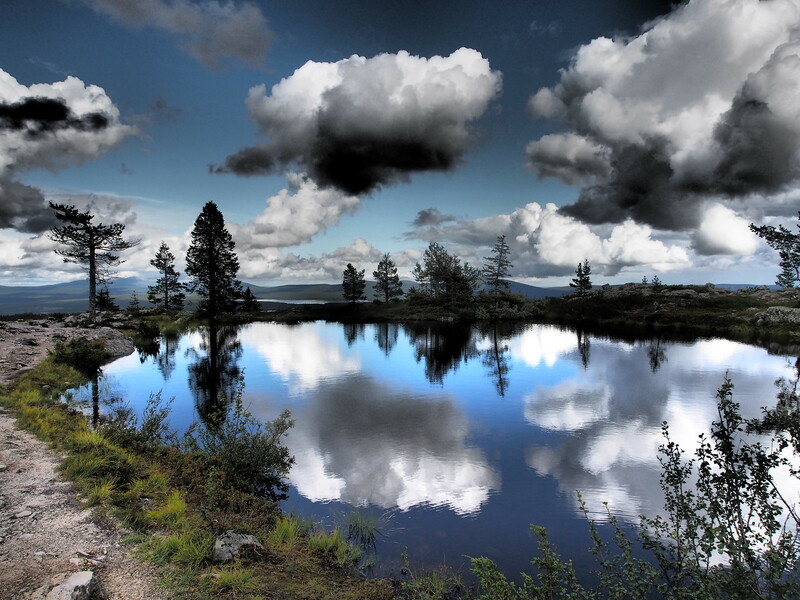 But the views on the photo below are all Finland. Sometimes you need to go all the way to Sweden to see how beautiful Finland really is! Luppioberget is a perfect hiking destination for adventurous travelers who enjoy climbing on rocks and jumping over cracks. I guess I don’t need to mention separately that I’m going to write a complete guide to Luppioberget in the near future. So, I drove in Sweden for about 100 km and crossed the border again in Tornio-Haparanda. The next stop was once again Kalajoki, the place where I camped when I started my road trip one week earlier. At the time of starting my coastal road trip through Finland, a British couple living in a camper van, Rachel and Chris, were actually camping in my yard in Rauma. When I left we agreed that we could set a camping date when I’m driving back home and Rachel and Chris would be driving along the West Coast of Finland up to Lapland and Sweden. My Instagram acquaintance Minna had given me another camping tip for Kalajoki, and I thought I would check the spot myself and then let Rachel and Chris know where we should camp. Once I finally reached the camping spot, there was a big surprise waiting for me. Rachel and Chris were sitting on the beach in front of their camper van eating pancakes. Look at that! And I hadn’t even told them where I was going to. Unbelievable! Have you ever heard someone saying ‘the world is small’? Well, it really is! After an evening swim, catching up and another stunning sunset we closed our eyes and fell asleep in our camper vans. In the morning I had one last struggle ahead of me, the one last drive from Kalajoki back to sunny Rauma. So, that was my coastal road trip through Finland. The mileage indicator on my car counted I have 2,004 km behind me, and yet I have so much ahead of me; A huge task of sorting out all the photos and all the thoughts, feelings and experiences from the past week and sharing them all with you. In case you have any wishes where I should start from—any destinations or activities you’re curious to find out more of—please let me know on the comments below. Now when I have spent one week crawling in the woods of Finnish Lapland, what do you think will be the next task on my list? Not sure yet when I’ll be around but I’ll let you know what that day comes! I’ve been to Finland, but I haven’t yet been to Lappland Saana, and I so want to see reindeer in the wild. And Father Christmas! I know!! Thanks a lot! I especially appreciated your Sarkijarvi-pics – – I´ve been up there once hiking but (stupid me) didn´t go to the pond which seemed heavenly..
I’ve been travelling in the East two winters in a row now, but a summer trip around the lake Saimaa would be lovely. I used to go there every summer when I was a kid, but now I haven’t been there for years.